Last weekend I was in a cake mood. I wanted not just any cake, but a chocolate layer cake! However, when my son came down with a stomach bug, baking was put on hold. It turned out for the best as this cake made the perfect Valentine's Day dessert. I combined this cake recipe from Tracey's Culinary Adventures with a modified version of this espresso icing from the Baker Chick. 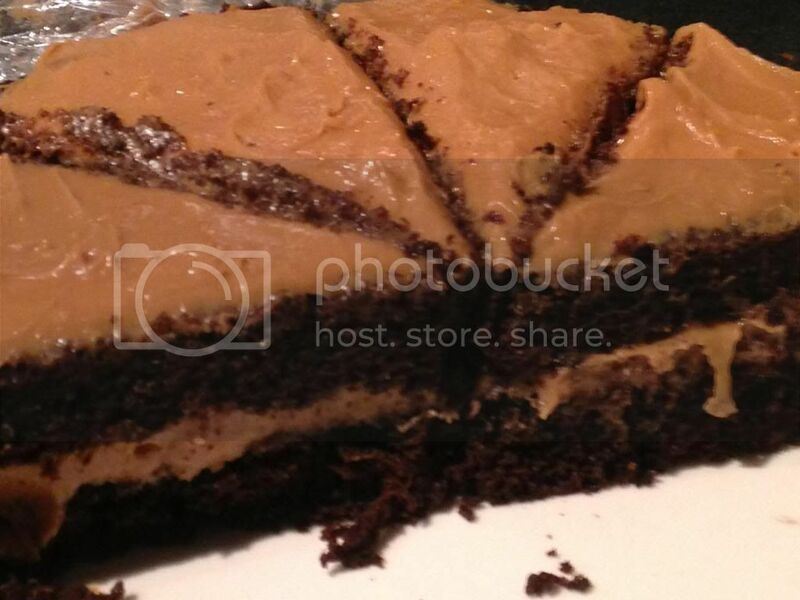 The cake was moist and delicious and the frosting had the perfect amount of coffee flavor. Definitely a keeper (as you can probably tell by the fact that more than half the cake is gone)! Preheat oven to 350 F. Grease and flour an 8-inch round pan. Whisk together the dry ingredients. Add the eggs, oil, and vanilla, beating until smooth. Gradually add the water, beating until smooth. Pour the batter into the prepared pan. Bake for 35-37 minutes, or until a toothpick inserted in the center comes out clean and the cake is nice and springy. Transfer the pan to a wire rack and cool for 15 minutes, then turn the cake out onto the rack to cool completely. Using a mixer, cream butter and cream cheese together. Add espresso and vanilla and beat well. Add sugar and half and half gradually until desired consistency is achieved. My skills at assembling a layer cake are rudimentary at best, but I know the basic routine, in theory. For best results, chill the cake and frosting for at least a short while before getting to work (~30 minutes). Using a large serrated knife, divide the cake into two even layers. My cake domed in the middle, so I actually trimmed the sides to get a smaller but taller cake. For easy maneuvering, use a cutting board or plate to stabilize the layers when flipping. Place the bottom layer on cake stand (or doily or parchment paper if you prefer a super clean presentation). Generously smooth 1/3 to 1/2 of the frosting on top of the first layer. Top with second layer, doing your best to center it. Store cake in the fridge until about a half hour before serving. Please note that this is a single-layer cake cut in half. If you prefer thicker or more layers to your cake, please double the recipe.